For a generation, or even two, ‘Waterloo’ is probably associated with Abba’s Eurovision winning song in 1974, or the 1967 hit ‘Waterloo Sunset’ by the Kinks. This year, however, we may be in danger of overlooking the bicentenary of the Battle of Waterloo, which was won by an Irish-born general on 18 June 1815. 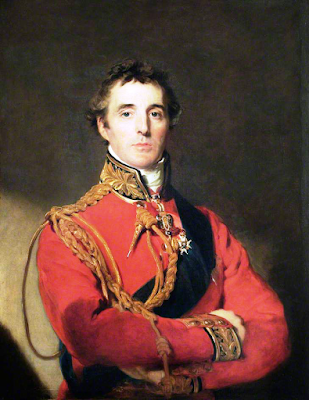 The Duke of Wellington was born plain Arthur Wesley on 1 May 1769 in Mornington House on Merrion Street, Dublin, close to Leinster House and opposite what is now the Taoiseach’s office. Mornington House took its name from Mornington, Co Meath, near Drogheda, which also gave the family a title. The family was originally named Colley, and can be traced back to Walter Colley, who moved from England to Drogheda about 1500. The duke’s grandfather, Richard Colley Wesley (1690-1758), 1st Baron Mornington, was born Richard Colley. In 1728, he inherited the estates of Dangan and Mornington, Co Meath, on the death of Garret Wesley, the husband of a distant, childless cousin, and within weeks he changed his surname to Wesley. The estates were first offered to a distant English relative, then a schoolboy at Westminster, Charles Wesley, brother of the great Methodist John Wesley. This offer was unaccountably refused, and the inheritance passed instead to Richard, who was MP for Trim, Co Meath (1729-1746), until he was given the title Lord Mornington. The duke’s father, Garret Colley Wesley (1735-1781), 1st Earl of Mornington, was born at Dangan, near Summerhill, outside Trim. He was MP for Trim (1757-1758) until he succeeded to his father’s peerage, and in 1764 he became the first Professor of Music at Trinity College Dublin. The young Arthur Wesley was educated in Trim and at Drogheda Grammar School before going to Eton. He entered the British army as an ensign at 18, and became an aide-de-camp in Dublin Castle to the Lord Lieutenant, Lord Buckingham. In 1789, he was elected MP for Trim. As a young officer, he met Catherine ‘Kitty’ Pakenham, but their marriage was blocked by her brother, the Earl of Longford, because young Wesley was in debt and had poor prospects. He was elected MP for Trim again in 1795, but turned down an offer to become Surveyor-General and left with his regiment for India, where his elder brother, Lord Mornington, became Governor-General. He was still known as Arthur Wesley until 1798, when he and the other family members changed their surname to Wellesley. When he returned to Ireland as Sir Arthur Wellesley, Kitty Pakenham’s brother changed his mind, and the two were married in Saint George’s Church, Dublin, on 10 April 1806. Meanwhile, he was elected Tory MP for Rye in 1806. A year later, he was elected MP for Tralee but decided instead to take his seat as MP for Newport on the Isle of Wight. He became the Chief Secretary for Ireland (1807-1809) and during this time in Ireland promised to work for the abolition of the remaining Penal Laws and for Catholic Emancipation. By 1815, following his successes in the Peninsular War, he was regarded as Britain’s foremost general, making him a natural choice to command the campaign against Napoleon. 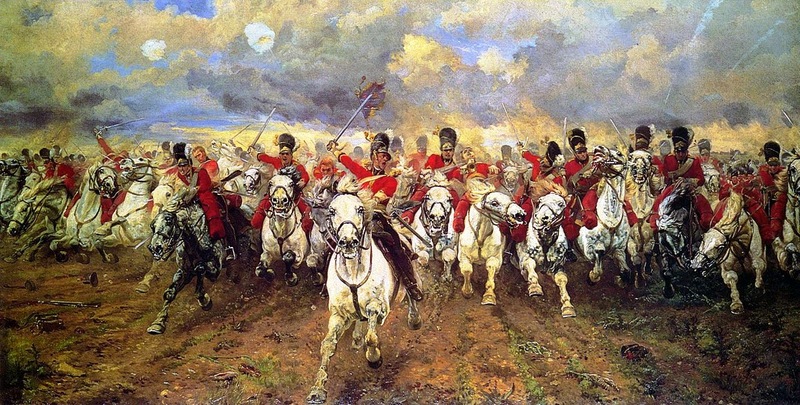 Many of Wellington’s generals, offices and soldiers at Waterloo were Irish too. The Irish formed a large proportion of Wellington’s army, and may have numbered many thousands. Three regiments with Irish names fought at Waterloo: the 27th (Inniskilling) Foot Cavalry, the 6th (Inniskilling) Dragoons and the 18th (King’s Irish) Hussars. The 7th and 18th Hussars were known as the ‘Drogheda Light Horse’ or the ‘Drogheda Cossacks’ because a former regimental colonel was the Earl of Drogheda, at one time an MP for the Kilkenny constituency of Saint Canice. The Irish generals at Waterloo included Major General Sir Denis Pack (1775-1823), from Kilkenny, who commanded the 9th British Infantry Brigade. His father, the Very Revd Thomas Pack, was Dean of Ossory (1784-1795). The most high-profile Irish officer to die at Waterloo was Major-General Sir William Ponsonby (1772-1815), who commanded the 2nd Cavalry Brigade. He had been MP for Bandonbridge, Co Cork (1796-1798), Fethard, Co Tipperary (1798-1801) and Derry (1812-1815). During a charge, he rode his horse into a muddy ploughed field, where he was attacked by French lancers and speared to death, although his Irish aide-de-camp, Major George de Lacy Evans, narrowly escaped death. His brother, Richard Ponsonby, later became Bishop of Killaloe. Their cousin, Lieutenant-Colonel (later Major-General Sir) Frederick Cavendish Ponsonby (1783-1837), was from Bessborough, Co Kilkenny, and was MP for Co Kilkenny (1806-1826). He was commanding the 12th Light Dragoons when he was unhorsed and left helpless on the battlefield until the following morning. In the agonising interval, a French lancer spotted him and ran his lance through his back. Insults were added to Ponsonby’s injuries when pickpocketing passers-by robbed him of his last remaining personal valuables. Major-General Sir John Ormsby Vandeleur (1763-1849), who had family roots in Co Laois and Co Clare, commanded the 4th Cavalry Brigade. He later retired to Merrion Square, Dublin. Many of the battalion and regimental commanders too were from Ireland. Lieutenant-Colonel John Millet Hamerton from Orchardstown, Clonmel, Co Tipperary, commanded the 2nd Battalion, 44th Foot. When he was wounded, his command passed to Major George O’Malley from Co Mayo. Colonel Hamerton is buried in Rathronan churchyard. Major Edwin Griffith, who was also from Clonmel, was killed on the battlefield. Lieutenant-Colonel Sir Andrew Barnard, from Fahan, Co Donegal, commanded the 1st Battalion, 95th Rifles. Major Arthur Rowley Heyland from Co Derry was killed at the close of the battle leading the 1st Battalion, the 40th Foot. The 2nd Battalion, 69th Foot, had at least three Irish officers, while the 13th Light Dragoons had an Irish commander, Lieutenant-Colonel Patrick Doherty, and at least four other Irish officers. Junior Irish officers included Captain Harry Ross-Lewin, from Ross Hill, Co Clare, of the 32nd Foot; his younger brother, Lieutenant Thomas Ross-Lewin; Captain Edward Thomas Fitzgerald from Co Mayo; and Captain Henry Edward Keane (1783-1866) of the 7th Hussars, a son of Sir Richard Keane of Cappoquin, Co Waterford. Many Irish soldiers earned distinction at Waterloo. Private Patrick Molloy of the 52nd Light Infantry, from Co Wexford, was severely wounded in his right arm. When Corporal James Graham from Clones, Co Monaghan, died in the Royal Hospital, Kilmainham, in 1845, he was described as “the bravest of the brave at Waterloo.” David Carroll, a tailor from Kilkenny who enlisted in the 42nd Highlanders – the ‘Black Watch’ – was wounded in the right leg at Waterloo. One Irish officer who earned an unhappy reputation at Waterloo was John Dawson (1781-1845), 2nd Earl of Portarlington, who lived at Emo Court, Co Laois. He was a colonel in the 23rd Light Dragoons, but on the eve of battle he absented himself from his regiment and went to Brussels. By the time he returned to Waterloo, the battle was under way and his regiment had gone into action without him. He then attached himself to the 18th Hussars and fought with bravery. Nevertheless, his reputation had been damaged. After Waterloo, Wellington became an increasingly influential Tory politician, and he resigned as Commander-in-Chief to become Prime Minister from 1828 to 1830. The highlight of his office was Catholic Emancipation, and his speech in the House of Lords in favour of was one of his best. Although Catholic Emancipation is identified with Daniel O’Connell, it was Wellington who pushed the Catholic Relief Act through Parliament despite opposition within his own party, and it passed with a majority of 105 only with the help of the Whigs. Wellington also threatened to resign as Prime Minister if King George IV did not give his Royal Assent. Wellington returned as Prime Minister for a short period of four weeks in 1834. When he died on 14 September 1852, aged 83, over a million people crowded to see his funeral in Saint Paul’s Cathedral, where he is buried in the crypt alongside Lord Nelson. Wellington Barracks, which was built near Buckingham Palace in 1833, was named in his honour, and when the former Richmond Prison in Dublin became a barracks in the 1890s it was renamed Wellington Barracks. The Wellington Column in Trim was erected in 1817. Work began on the Wellington Monument in the Phoenix Park, Dublin, that year, but due to a shortage of funds it was not completed until 18 June 1861. This 62-metre obelisk has bronze panels celebrating the highlights of his career, including Waterloo, India, the Peninsular Campaign and Catholic Emancipation. For much of the 19th century, the area in the Phoenix Park around the Wellington Monument was the venue for an annual military review on Waterloo Day, 18 June. The fact that the monument lies in a sleepy hollow in the Phoenix Park rather than in a prominent place in the city centre may have unwittingly aided its survival. In the post-independence haste to wipe out memories, Wellington Barracks in Dublin was renamed Griffith Barracks in 1922. Today it is Griffith College Dublin – no-one ever dreamed of calling it Wellington College. His name survives too in Wellington Bridge, Co Wexford, Wellington Road, Cork, and Wellington Quay, Dublin, and in a cluster of street names in Ballsbridge, including Wellington Road and Waterloo Road. A new bridge in Dublin was named the Wellington Bridge at its opening in 1816, a year after Waterloo, but it has been known ever since as the Ha’Penny Bridge. It shall be interesting to see how Ireland is involved and how Ireland remembers Wellington and Waterloo later this year. I have been meditating each morning throughout Lent this year on a hymn or a piece of music associated with the great English composer Ralph Vaughan Williams (1872-1958). I concluded this series with my closing meditation yesterday [4 April 2015]. 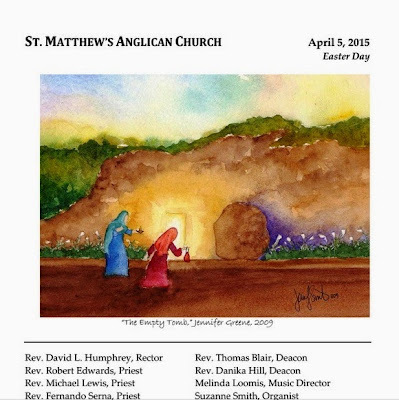 In the Easter Eucharist in Saint Matthew’s Anglican Church, Portland Oregon, this morning [5 April 2015], they have selected George Herbert’s hymn, ‘Rise, Heart, Thy Lord is Risen,’ with a setting by Vaughan Williams, as the Offertory hymn. George Herbert (1593-1633) was a skilled priest, poet, teacher, and an accomplished musician. Herbert turns to his lute to assist him in song, drawing on Scripture to illustrate the poem (Psalm 57: 8-10 and the theme of the Letter to the Romans exploring how we are made right with God through Christ’s death on the cross). “Calcined: a chemical term referring to the process where impurities are removed from precious metals, or the means of reducing things like lime or some other similar substance. Herbert is thinking of how at death our bones are reduced to chalk or our lowest commonest denominator, the dust of which we all are made. “Three parts”: most chords have only three different notes that are repeated and multiplied at different octaves in different voices or instruments. Herbert’s identification of all music as but “three parts vied and all multiplied” recalls the Trinity, and how this relationship is played out in each of us. As a result, our cacophony becomes euphony as we are harmonized according to the interplay of Father, Son and Holy Spirit. Just as chords are fundamentally composed of triads, Herbert sees the worship of his heart and lute as incomplete without the aid of the Holy Spirit. The Spirit makes “up our defects with his sweet art”. Notes from an article by the Rev. Canon Patrick Comerford, Dublin, Ireland. Used with permission. Holy Week has been a busy culmination to Lent this year. I have been in Christ Church Cathedral regularly though the week, taking part in the Palm Sunday Eucharist [29 March 2015], the Chrism Eucharist on Maundy Thursday [2 April 2015], and last night’s Easter Eve Eucharist, when I assisted at the administration of the Holy Communion. I also presided at the Maundy Eucharist in All Saints’ Church, Grangegorman, and led the ‘Seven Last Words’ service there on Good Friday [3 April 2015]. On one day this past week, I was at four services in three different places. I am back in Christ Church Cathedral this morning [5 April 2015] for the Easter Eucharist. Twice during the past week, I noticed two rows of tiles, almost hidden in the north and south sides of the sanctuary, each with five white cinquefoils or roses. The only other place this design or theme appears is one part of the south ambulatory. Prompted by the recent funeral of Richard III in Leicester Cathedral 10 days ago [26 March 2015], I wondered whether these Victorian tiles are a humorous play on a Yorkist theme associated with the cathedral: the 10-year-old Yorkist pretender Lambert Simnel was crowned in Christ Church Cathedral as King Edward VI on 24 May 1487. The story of that coronation is told by Dr John Ashdown-Hill in The Dublin King, which was launched in Christ Church Cathedral about two months ago [12 February 2015]. He was one of the team that discovered Richard III’s body in a car park in Leicester three years ago [August 2012], and in this new book he explores the story Lambert Simnel. However, he refuses to use the name Lambert Simnel for the Dublin King and believes there is convincing evidence that he was the legitimate Yorkist heir to the throne of Richard III. He suggests that he was neither Lambert Simnel nor one of the ‘Princes in the Tower’ but perhaps Edward Plantagenet, Earl of Warwick and son of George, Duke of Clarence, the brother of Richard III. It would be interesting to explore the story behind those ‘York Rose’ tiles in the sanctuary and the south ambulatory, but there are no references to them in Joanna Wren’s delightful little book, Floor Tiles, a guide to the medieval and 19th century floor tiles of Christ Church Cathedral, Dublin. Because of their almost-hidden location, these 19th century ‘York Rose’ tiles receive little attention. Instead, the tiles that catch the imaginations of most visitors are those with the circular panels decorated with the paired pilgrim foxes, representing the mediaeval friars of the cathedral, and the geometric and floral designs. The majority of the floor tiles are 19th century copies of mediaeval floor tiles found during restoration of Christ Church by George Edmund Street in the 1870s. They were made by Craven Dunnill and Co of Shropshire, who also worked on commissions for Chester Cathedral and Bangor Cathedral in Wales. The manufacture and use of encaustic tiles like these was an integral part of a revival of Gothic architecture and art, particularly where the design of a cathedral or church was inspired or influenced by AWN Pugin (1812-1852). Joanna Wren discusses many of the patterns and designs in the tiles made by Craven Dunnill, and how most of the Victorian tiles are copies of mediaeval ones, some of them are original designs. However, it seems to me that the lions rampant, which can be seen on tiles throughout the cathedral, particularly on the south side of the high altar, are not based on designs found in the cathedral’s mediaeval tiles during Street’s restoration, but on a design that was introduced or reintroduced by Pugin in the early 19th century. Pugin made drawings for tiles during his many journeys on the night train from London to Staffordshire while he was engaged in restoring and rebuilding Alton Towers. The lion rampant, rather than the talbot, was the primary heraldic symbol of the Talbot family, Earls of Shrewsbury and proprietors of Alton Towers. The tiles Pugin designed were manufactured by Minton & Co of Stoke-on-Trent in north Staffordshire ca 1842-1844. In the 1840s, Pugin developed a creative partnership with Herbert Minton (1793-1858), a pottery manufacturer in Stoke-on-Trent. The early products by Thomas Minton (1765-1836) were standard domestic tableware in blue transfer printed or painted earthenware, including the Willow pattern. His son Herbert developed the process of making encaustic tiles, and together Minton and Pugin went beyond a mere revival of mediaeval patterns to develop finely-finished multi-coloured tiles with intricate designs and with a higher degree of accuracy than anything produced in the Middle Ages. 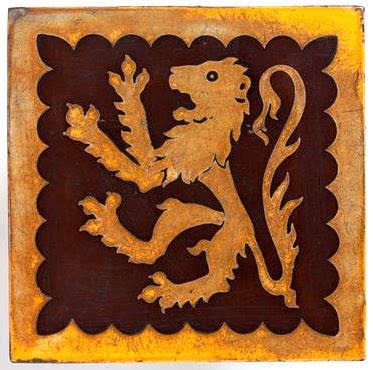 An interesting example of these Pugin-designed, Minton-manufactured tiles with a symbol of a lion rampant is seen in a red earthenware tile with inlaid decoration that is now in the Victoria and Albert Museum, London. The Alton Towers tiles were made for Pugin by Minton in Staffordshire 30 years – a whole generation – before Craven Dunnill made the Christ Church tiles for Street. Pugin’s working relationship with Herbert Minton resulted in the designing and making of some the best church tiles of the Victorian era. He was using Minton tiles as early as 1840 for the Hardman’s Hospital Chapel in Birmingham. By 1844, Minton was making more colourful encaustics probably at Pugin’s instigation. The polychromatic effects of the encaustic floor tiles in Cheadle blend perfectly with the colourful wall and ceiling decorations and the stained glass windows. Minton went on to supply tiles to other architects working in the Gothic Revival style, and so encaustic tiles are often known as Pugin tiles, irrespective of who their designer is. Pugin’s use of encaustic tiles was followed by the other leading architects of the Gothic revival, including: Sir George Gilbert Scott, William Butterfield (Westminster Abbey, All Saints’ Church, Margaret Street and Keble College, Oxford), George Edmund Street (Christ Church Cathedral), William Burges (Saint Finn Barre’s Cathedral, Cork) and John Pollard Seddon (Llandaff Cathedral). The fine Minton tiles in the choir in Lichfield Cathedral were inspired by the medieval ones found in the choir foundations and still seen in the Cathedral Library. Today, more than half the churches in Britain are paved at least in part with 19th century decorative encaustic tiles and they are often the most notable features in a church. Many visitors to Christ Church Cathedral, Dublin, ask whether the rampant lion is a symbol of the English royal family; few realise that was a heraldic symbol of the Talbot family, and that through Pugin’s influence it became a popular and unquestioned heraldic theme in the encaustic tiles made for many Gothic revival churches throughout these islands from the mid-19th century on.